Each and every time I host a party I have to have at least one bowl of my own homemade salted pecans or other nuts. I realize the ingredients are simple, but oh so tasty. I get so many compliments when I make them. You will get compliments too, if you make your own salted nuts. Line a sided baking sheet with aluminum foil. Find a place to cool your nuts. Put a piece of newspaper down and then cover it with paper towels. Place the nuts in a large bowl. Add the melted butter and mix until the nuts are completely coated. Add the salt and stir again. Make sure the salt makes it through the entire bowl of nuts. 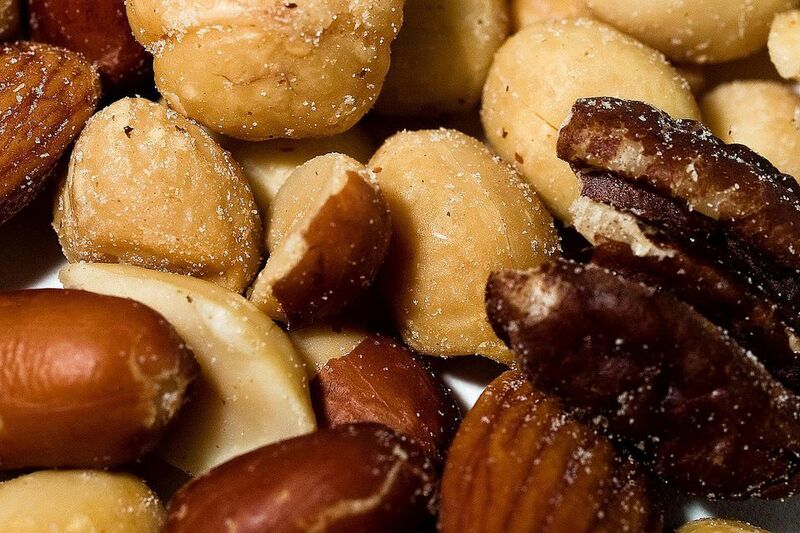 Spread the nuts in a single layer in the prepared baking sheet. Bake the nuts for 15 to 20 minutes. Stir the nuts occasionally. Cool them in the pan for 15 minutes on cooling rack. Transfer the nuts to the paper towels to cool completely. Store** the salted nuts in an airtight container. * You don’t have to limit yourself to pecans or walnuts. These days you can buy all sorts of raw nuts. You’re only limited by your imagination. ** Especially during the Christmas holidays, you may wish to make up several batches. They freeze beautifully in an airtight reseable plastic bag. My daughter likes to give salted nuts as gifts. She mixes the salted nuts with the sugared nuts. She puts them in canning jars topped with squares of pretty fabric and tied with coordinating ribbon. Take some nuts and a few pretzels, cover them with chocolate and you’ve got this recipe. The name kind of reminds me of going to a baseball game. This is such a bizarre food combination. Who would have through that using soda crackers as a base for butter, brown sugar and chocolate would taste so delicious.